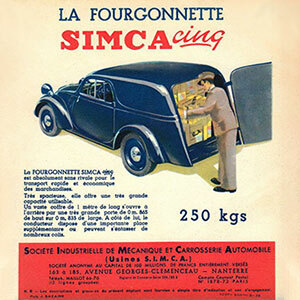 The Simca Cinq (1938-1949) spare parts catalogue is scanned from an original Simca spare parts book which was in a superb state. This parts book does have a total of 96 pages, with exploded views, and lists with parts numbers and the associated description of the relevant parts. The parts book is made specific for the Cinq model. To have a convenient navigation through the file, a handy menu structure is created at the left side of the file. Beside this menu, there is also the possibility to use the original "Table of Contents" (TABLE DES MATIERES) to navigate through the file. All the text of the "Table of Contents" is linked to the associated pages. Download here a sample page of the Simca Cinq spare parts catalogue. Or if you like to order the SimcaCinq (1938-1949) spare parts catalogue, click on the "Add to cart" button.